At OptinMonster, we’re known for our signature Exit-Intent® technology. Today, we’re pushing our targeting even further by announcing the InactivitySensor™, exit-intent for mobile. On top of that, we have also added two of the most requested features from our users: sub-accounts activity log and a native integration with GetResponse360. At OptinMonster, our goal is to help recover abandoning website visitors into subscribers and customers. That’s why we were the first to offer a powerful Exit-Intent® technology that our customers have seen tremendous success with. Now we’re pushing that even further with our new InactivitySensor™. This allows you to grab the attention of disengaged and abandoning visitors on any device (mobile, tablet, and desktops). InactivitySensor™ monitors user behavior and detect when a visitor stops all activity on your site (scrolling, mouse movement, or typing). After that, it triggers a targeted campaign based on the setting you choose. It’s available for all existing and new Pro users. Login to your account to see how well it works to convert those abandoning visitors! 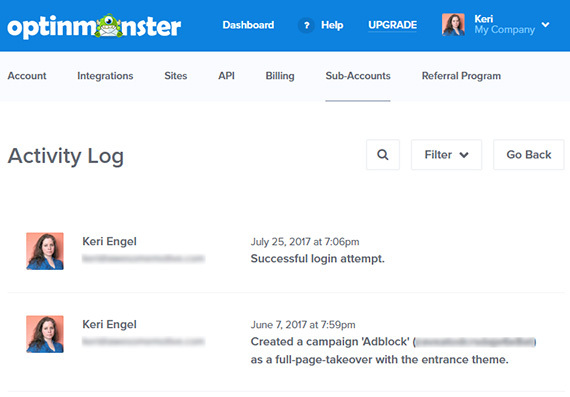 In OptinMonster 4.0, we announced our new sub-accounts feature, which enables you to grant account access to coworkers or clients, while managing permissions. With our new activity logs feature, you can keep track of all changes with your campaigns, so you can easily undo a change if its not to your liking. Activity logs are now available for all users with sub-accounts (Pro and higher level subscriptions). To see who’s doing what on your account, just login to OptinMonster, click Sub-Accounts in the main menu, and then click on the Activity Log button. We have also added a search feature and advanced filters by site, campaign, or users to help you easily find what you are looking for. One of the ways we want to make OptinMonster even more valuable to you is by integrating with all the best email marketing services. If you’re a user of GetResponse360, we now have a new native integration, so you can now easily connect your OptinMonster account with GetResponse360 in just a few clicks. For step by step instructions, see our guide on how to connect GetResponse360 with OptinMonster. We’re nearly done with our custom branding release for agencies. We also have several holiday specific templates in the works that will be released in October. To be the first to know of new releases, be sure to subscribe to our email newsletter and follow us on Twitter and Facebook. If you’re not already using OptinMonster, and you want try out OptinMonster’s new InactivitySensor or other features, then try OptinMonster today, and you’ll see why our users consistently rate us as the most powerful conversion optimization software in the market.